British singer Adele was the big winner at the Grammy Awards 2012 in Los Angeles, winning six prizes including record, song and album of the year. Adele also made her live comeback at the ceremony, performing for the first time since having throat surgery last year. Rock band Foo Fighters won five prizes, while rapper Kanye West scooped four. The 54th edition of Grammy Awards ceremony saw heartfelt tributes to pop star Whitney Houston, who died on Saturday, while Amy Winehouse received a posthumous award. Amy Winehouse’s parents accepted her prize for best pop duo/group performance for Body and Soul, her duet with Tony Bennett, which was the last recording the artist made before she died in July. 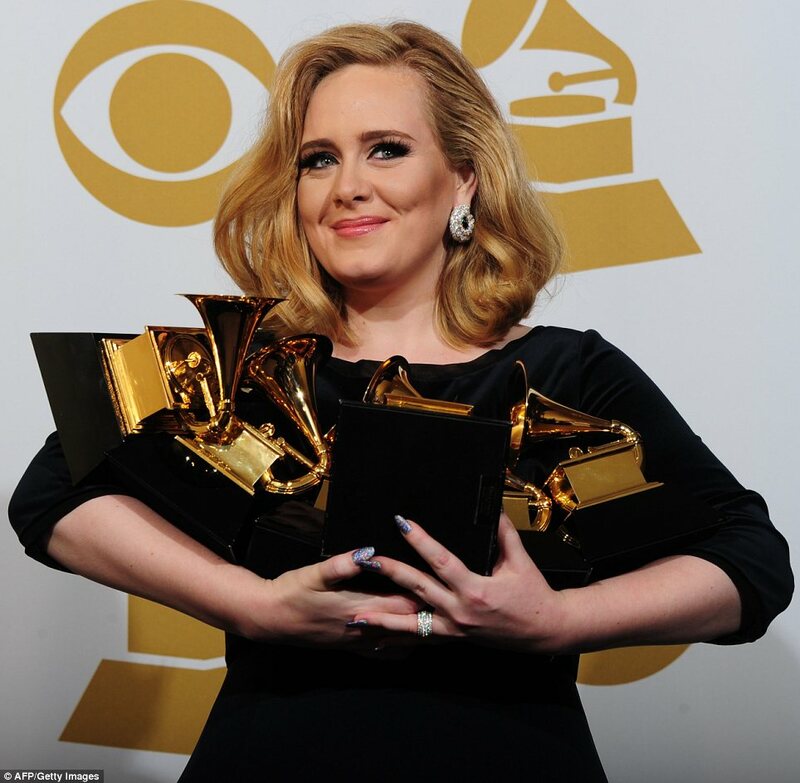 Adele won every award she was nominated for, including record of the year, song of the year and best short form music video for Rolling in the Deep. Her second album, 21, was named album of the year. “This record is inspired by something that is really normal and everyone’s been through it, just a rubbish relationship,” Adele said. Adele was forced to cancel all live dates last year but earned a standing ovation after her return to the stage with Rolling in the Deep. The British artist’s producer Paul Epworth, who also worked with Foster the People, Florence and the Machine and Cee Lo Green, was named best non-classical producer. Foo Fighters’ awards included best rock album, best rock song, best rock performance and best hard rock/metal performance. “This is a great honour because this record was a special record for our band,” frontman Dave Grohl told the crowd. Kanye West’s solo album My Beautiful Dark Twisted Fantasy earned three awards, including best rap song and best rap album. The track Otis – from Watch the Throne, his collaboration with Jay-Z – was named best rap performance. The prize takes West’s total Grammy haul to 18. Neither he nor Jay-Z were present to pick up their awards. Bon Iver, fronted by US singer-songwriter Justin Vernon, were named best new act, five years after their acclaimed debut album was released. Their self-titled second LP also won best alternative album. Other British victors included soul singer Corinne Bailey Rae, who scooped best R&B performance for Is This Love. There was also success for Sir Paul McCartney, whose deluxe reissue of Wings’ Band on the Run was named best historial album. US dance DJ Skrillex won three prizes, while double winners included folk duo The Civil Wars, country star Taylor Swift and gospel singer Kirk Franklin. Chris Brown – returning to the event for the first time since 2009 – won the trophy for best R&B album for F.A.M.E. Chris Brown was returning to the event for the first time since assaulting his then-girlfriend Rihanna before the 2009 ceremony. Rihanna – the ex-girlfriend Chris Brown assaulted before the ceremony three years ago – was also present, taking to the stage with British band Coldplay. Also playing live were Bruce Springsteen, McCartney, the Beach Boys and Kelly Clarkson. Jennifer Hudson gave a rendition of Whitney Houston’s I Will Always Love You in a tribute to the late singer. The ceremony also saw Alicia Keys and Bonnie Raitt sang a duet of A Sunday Kind of Love in tribute to Etta James, who died last month.